Alpha Zero defeated Stockfish after only 9 hours of self-play. On the other hand, Lc0, has been training for several months and while attaining impressive strength (to say the least...) it's still not crushing Stockfish. What can be the reason for such a dramatic difference in learning efficiency? This is happening because AlphaZero and Leela aren't playing against the same Stockfish. If you read the paper, AlphaZero beat Stockfish 8 (it also played a series against Stockfish 9 - same logic applies however). Both these versions of Stockfish are old, and significantly inferior to the latest version of Stockfish. AlphaZero beat Stockfish 8 by +155 -6 =839. That's a ~50 elo difference. On the other hand Stockfish 10 is better than Stockfish 8 by ~100 elo. Leela, playing against Stockfish Dev (which is even better than Stockfish 10 - the engine is continuously updated) and not Stockfish 8, could be as good as AlphaZero yet fail to crush Stockfish. It would crush Stockfish 8 alright, but not Stockfish Dev. On a side note: it's not clear that AlphaZero would crush Stockfish 10 either, or vice versa, because elo isn't transitive: if A beats B by 50 elo and B beats C by 50 elo, it doesn't mean that A beats C by 100 elo. Edit: To illustrate, in the TCEC cup semifinals, Leela vs. Stockfish, the version of Stockfish that played was Stockfish 270918. The last six numbers is the date - Stockfish as of the 27th of the 9th month of 2018. 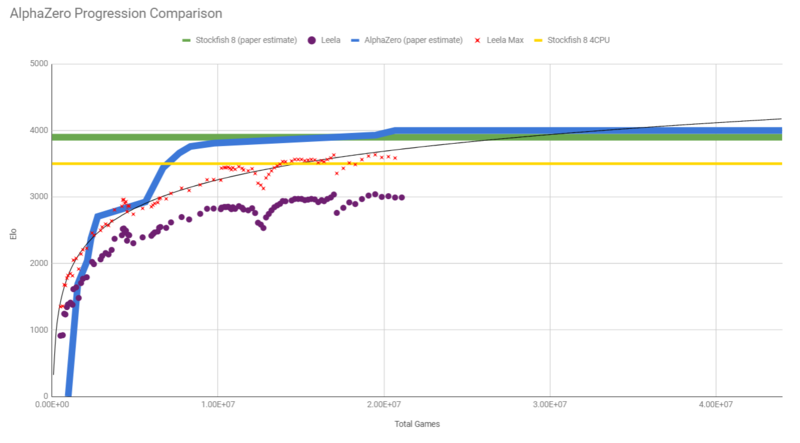 You can see from the link above that this version of Stockfish is roughly 100 elo stronger than Stockfish 8, so the fact that Leela performs worse against it is not a surprise. In short, because DeepMind has TPUs. Lots and lots of TPUs. By far, the most time-consuming part of the training process is generating self-play games. 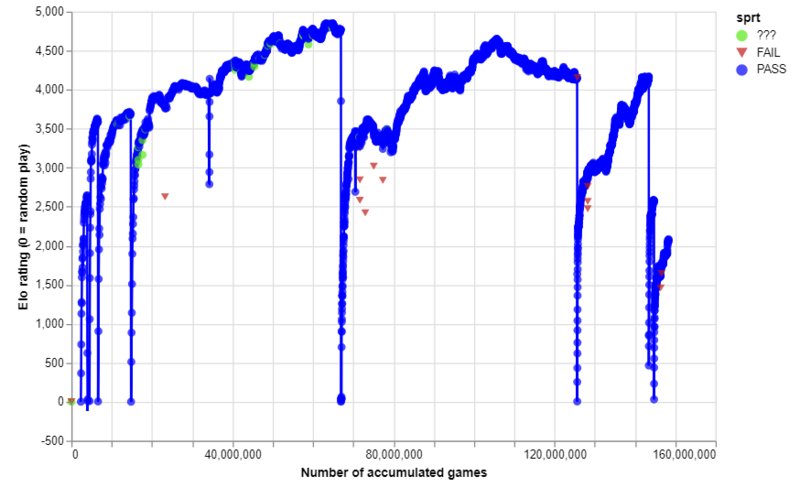 DeepMind used 5000 TPUs to generate self-play games, which is a lot of processing power. Meanwhile, Lc0 crowdsources processing power from volunteer clients, which is much slower. We trained a separate instance of AlphaZero for each game. Training proceeded for 700,000 steps (mini-batches of size 4,096) starting from randomly initialised parameters, using 5,000 first-generation TPUs to generate self-play games and 64 second-generation TPUs to train the neural networks. Meanwhile, the Lc0 project got started sometime in January 2018, and by April 2018, they'd only generated 8.2 million out of the needed 44 million games. I believe they were generating about 200k games per day at the time. test10: The original 256x20 test run. This was a separate pipeline using a completely rewritten lc0.exe engine that was much faster at generating self-play games. Net numbering for this run started with ID10000 on June 27, 2018, and ended with ID11262 on August 30, 2018.
test20: A run with various changes, starting with ID20001 on August 30, 2018 and ending with ID22201 on November 16, 2018.
test30: A run testing various new ideas, starting with ID30001 on September 9, 2018. As of January 14, 2019, the best net was ID32598. test40: The December 6, 2018 AlphaZero paper revealed a lot of differences between what DeepMind did and what Lc0 did, and it looks like a new test run started with ID40001 on January 8, 2019. As of January 14, 2019, the best net was ID40202. "Leela Max" is Leela's theoretical maximum performance when given hardware and/or time to the point of absolute diminished returns. It may be more comparable to AlphaZero, as AlphaZero operated on 4.8 million nodes per move, whereas a conventional setup only gets a small fraction of that. These days, the self-play generation speed is much faster than it was at the beginning. As of January 14, 2019, it looks like the project is generating about 1.5 million games per day. But at this speed, it'll still take a month to achieve what DeepMind achieved in 9 hours. More like double the time, really, if the training games are being diverted towards two separate runs. Not the answer you're looking for? Browse other questions tagged engines alphazero leela or ask your own question. Alpha-beta safe on incomplete tree? A new AI wins at go. Can a similar AI win at chess? Can it achieve pure self-training?